Choose "putty.exe" for Windows 95, 98, ME, NT, 2000, XP and Vista on Intel x86 and save to your local disk drive. Step 1: Launch putty.exe and follow the setup instructions here. Note: If this is your first time using putty to access the MPS system, you must call for assistance at this point. Step 2:	Enter “alpha1.digitalsynergyinc.com” at the Host Name [or IP address] prompt. Be sure that Port selection is “22” and Protocol is “SSH”. Step 4: Enter your remote access username at login as: prompt. Step 5: Enter your remote access password at password: prompt. If you do not have a remote access username and password, call MPS for assistance. 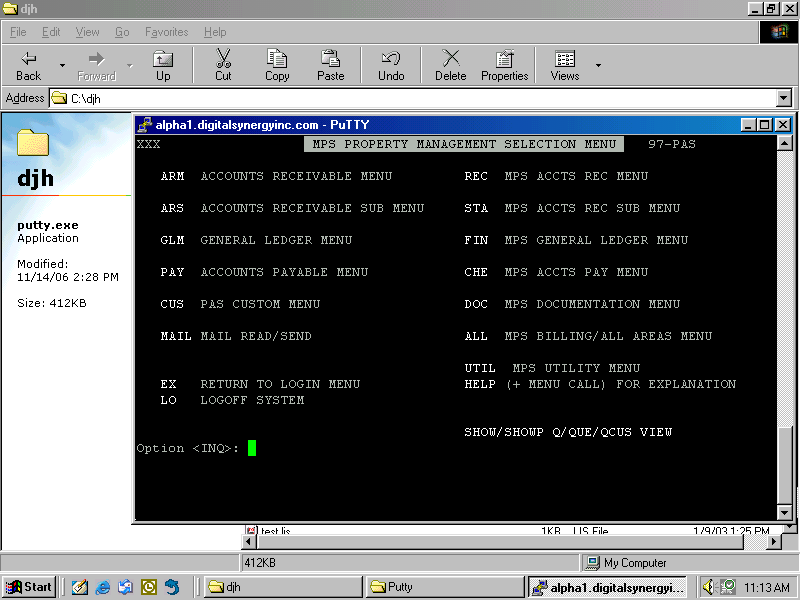 Step 6: Enter “MPS” at Option prompt from MPS Remote Access Menu. Step 7: Login to MPS system using your existing MPS username and password. When you are finished, please logout of all sessions (command “LO”).